In the earlier two posts of this series (HDL and Immunity, April 12; HDL: Higher is Good, But is Highest Best?, April 14), we established that HDL is central to the immunity and toxin clearance, and that it’s probably desirable to have more of it than our body’s natural levels, since we are in a more pathogen-and-toxin-rich environment than the Paleolithic and evolution hasn’t caught up to the situation. I tend to view HDL >85 or 90 in the presence of other inflammatory or immunological markers as a potential sign of infection or immune dysregulation. I don’t have the reference handy, but I came across a study associating elevated HDL and CRP (occurring together) with INCREASED risk of heart disease…. I frequently see HDL >100 in patients with several other markers of inflammation, such as elevated CRP, ferritin, WBC, monocytes, etc. Heart attacks result from a high burden of infected atherosclerotic lesions. When the body is fighting infections, it upregulates its defense mechanisms, including HDL. This could explain why runners have higher levels of HDL: to fight infections that abound among them! And, the fact that pathogen-fighting HDL particles do not go back to the liver can explain why the half-life of HDL in runners is much higher than in sedentaries http://www.ncbi.nlm.nih.gov/pubmed/6748208. These facts lead us toward one possible strategy for raising HDL: swallow a lot of pathogens! But this isn’t likely be desirable. Higher HDL may do some good, but the pathogens are likely to do a lot more harm. Beneficial Methods. These methods have no known toxicity, but cause the body to increase HDL levels – perhaps because of an association with danger in our evolutionary past. Mildly Toxic, Plausibly Beneficial Methods. These methods have some toxicity, but there is a plausible case to be made that the toxicity is innocuous or insignificant, so that the benefits of higher HDL will outweigh the harms. Damaging Methods. Intentionally swallowing HDL-increasing pathogens or toxins is probably a bad strategy most of the time, and should be avoided. I’ll look at tactics one by one. One of the most powerful, and probably also benign, ways to raise HDL is intermittent fasting or ketogenic dieting, with ketosis enhanced by the use of coconut oil or MCT (medium-chain triglyceride) oil. Ketosis stimulates the ketone receptor GPR109A, which strongly induces HDL synthesis. GPR109A is better known as the receptor on which niacin acts to raise HDL, but its physiological ligand was not known until recently when it was found to be the ketone beta-hydroxy-butyrate. It looks like any time a human goes into ketosis, HDL is upregulated. Ketosis occurs during fasting, and involuntary fasting is a threat to health that forces eating of marginal foods from which infection risks are high. Ketosis can also be induced by a lack of carb-containing plant foods; this would naturally lead to a shortage of animal foods, and famine, soon after. Famine depresses immunity and increases risk of infection. Drought was probably a common cause of both lack of carb-rich foods and famine. Drought would tend to force reliance on marginal, polluted or infected water sources. In the modern world, we control our food intake and can generate ketosis safely without ever reaching a famine state that significantly depresses immunity. There are safe ways to activate GPR109A via intermittent ketogenic dieting with minimal risk of ill effects. 1. Promotion of protozoal and fungal infections. While ketogenic dieting is helpful against bacterial and viral infections, fungi and protozoa are eukaryotes who can metabolize ketones in their mitochondria. In fact, because ketones are water-soluble small molecules and diffuse into pathogen mitochondria, while glucose and fatty acids are chaperoned through the human body by transport molecules, ketones are a uniquely available energy substrate for parasitic fungi and protozoa. Moreover, glucose is a major resource for the immune defense against these pathogens, and induction of ketosis by carb restriction can diminish immunity against protozoa and fungi. Since protozoal infections such as Toxoplasma gondii and fungal infections such as Candida are now common, each afflicting perhaps 30% of the population or more, this is a major concern. 2. Ketosis induced through severe carb and protein restriction may trigger the dangers of zero-carb dieting. I’ve done a series on this (it started here). The solution is to achieve ketosis intermittently, through tactics like daily intermittent fasting, and to induce it positively through the consumption of short-chain fats such as are found in coconut oil or MCTs, or through leucine supplementation. A healthy diet, ketogenic or not, should meet our recommendations of at least 200 carb calories from starches and at least 600 calories from carbs plus protein. Exercise is another method for raising HDL that seems entirely healthful. In the evolutionary environment, continuous exertion probably signaled danger: either a difficult hunt or, more likely, some form of warfare with other humans. In either case, injury and a need for wound repair was a likely prospect. Breaching of the skin barrier by wounds mean infections. 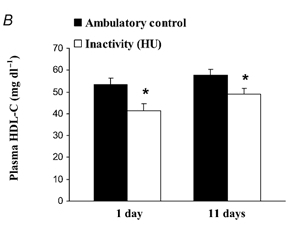 Since HDL plays a role in wound repair and infection resistance, it would make sense to upregulate HDL production during exertion. The same phenomenon occurs in humans: 20 days of bed rest leads to a 20% reduction in HDL . Overall, the most effective way to raise is HDL through activity is simply to reduce the daily time spent sitting and increase the time spent standing or walking. Sitting is also a major risk factor for obesity, diabetes, and cardiovascular disease. So it looks like high activity levels are strongly health-improving. Until recently I was sitting or sleeping about 23 hours a day, which can’t be healthful. To repair that I recently built a standing desk. Now I stand, kneel (on a padded bench), or half-kneel half-stand throughout my working hours. I strongly recommend a standing desk as an effective way to increase HDL. Which long-chain fats are best? A case can be made for dairy fats. The reason dairy fats work is uncertain. The mechanism could be via chylomicron breakdown, and other fats might work nearly as well. People who eat the most dairy fats probably eat high-fat diets that are low in omega-6 fats, and omega-6 fats reduce HDL; so the dairy fats could just be a marker for high-fat low-omega-6 diets. However, it’s possible that the ruminant trans-fat CLA is especially beneficial. It might not hurt to copy Seth, and eat a lot of butter. Interestingly, drinking alcohol may be a healthful way to raise HDL. We’ve previously discussed epidemiological evidence for health benefits from drinking and the matter of how to drink safely (Is It Smart to Drink?, Sep 9, 2010), but didn’t discuss alcohol’s effect on HDL. This is good news because alcohol alone does not damage the liver – only the combination of alcohol with polyunsaturated fats – either omega-6 or omega-3 will do. As long as alcohol is consumed only with saturated fats, it is likely to be beneficial to health. In an analysis of the MRFIT trial, alcohol’s HDL-raising effect was found to be responsible for half of its benefits for mortality from coronary heart disease. It appears that alcohol’s other health benefits, from its glucose-lowering effect to its stress-relieving effect, are less important for health than its HDL-raising effect. Niacin supplementation is the most common doctor-prescribed way to raise HDL. Dr. William Davis of Track Your Plaque fame is an ardent advocate of niacin, as are many other cardiologists. 1. Niacin is toxic whereas ketones are not. 2. Ketones diffuse throughout the body whereas niacin binds certain cells, notably fat cells, preferentially and this concentrates its toxicity. Major sites of niacin binding are the skin, the liver, and the fat surrounding the kidney. This is why these are sites of niacin toxicity: the toxins from niacin conversion are localized here. Niacin toxicity results from the manner in which it is converted to the active forms of vitamin B3, NAD and NADP. Niacinamide, an alternative form of vitamin B3, is converted to NAD and NADP without toxicity, but does not stimulate the GPR109A receptor and does not raise HDL levels. Time-release niacin is especially prone to poisoning the liver. The liver’s main niacin disposal pathway can only metabolize a small amount of niacin at a time. Time-release niacin causes more niacin to pass through this high-toxicity liver pathway. Another issue with niacin is that NAD is the rate-limiting vitamin for bacterial metabolism. Excess vitamin B3 intake, therefore, promotes bacterial infections. In general, I consider niacin to be an alternative to coconut oil-driven ketosis rather than a complement to it. Both niacin and ketones act on the same receptor, and the HDL increases from coconut oil alone are so large (commonly to 120 mg/dl or higher) that adding niacin on top would be gilding the lily. Since benefits from niacin against atherosclerosis probably come either from HDL increases or from other effects of activating GPR109A , it is likely that coconut oil delivers all or nearly all the benefits of niacin. In most cases, due to its lack of toxicity, coconut oil should be preferred. The exception would be people who have significant protozoal or fungal infections but not bacterial infections. Since ketones feed the former while niacin feeds the latter, such people may benefit from niacin instead of coconut oil. Micronutrients that are beneficial may include vitamin C, taurine, and glycine. Bile acids are made from cholesterol using vitamin C and are then conjugated with taurine and glycine. Bile duct blockage tends to lower HDL and providing bile-supporting nutrients like vitamin C  and taurine [22, 23] can under some circumstances raise HDL. Glycine is richly present in gelatin (cooked collagen), and taurine in uncooked or rare meats. Plant fiber and polyphenols have been reported to raise HDL. For instance, a polyphenol-rich carob fiber was found to raise HDL by 7% while lowering LDL , and psyllium has been reported to raise HDL . It is unclear to me whether this is a beneficial pathway or not. On the one hand, butyrate and other volatile fatty acids from gut flora may stimulate the ketone receptor. On the other hand, many of these polyphenols are directly toxic, and fiber increases gut bacterial populations and endotoxin flux into the body. HDL may be upregulated because it has more toxins to clear. Higher potassium excretion is associated with higher HDL, suggesting that high intake of potassium-rich foods like potatoes, bananas, and vegetables might raise HDL. Since potassium-rich foods are also usually fiber-rich, this association may be mediated by short-chain fats from fermentation of fiber by gut bacteria. But potassium is a nutrient low-carb dieters can easily become deficient in, so it may be worth tending to. Japanese-style meals are low-toxicity and essentially Perfect Health Diet compliant. The alternative is probably western style food high in wheat, vegetable oils, and sugar. HDL can be raised in destructive ways – such as ingestion of toxins or pathogens – but there are healthy ways to raise HDL. Eat a nourishing diet rich in saturated and monounsaturated fat, especially dairy fat, but low in omega-6 fats, fructose, and other toxins. In short: eat the Perfect Health Diet. Be physically active. Be on your feet as much as possible; favor a standing desk over sitting. Do resistance exercise or other intense exercise occasionally. Engage in intermittent fasting, and consume a lot of coconut oil, coconut milk, or MCTs to stimulate the ketone receptor. Niacin, the most effective pharmaceutical for raising HDL, has some toxicity and is probably inferior to coconut oil and intermittent fasting except in people with protozoal or fungal infections. Our best wishes for high HDL! Navab M et al. HDL and cardiovascular disease: atherogenic and atheroprotective mechanisms. Nat Rev Cardiol. 2011 Apr;8(4):222-32. http://pmid.us/21304474. Ahmed K et al. GPR109A, GPR109B and GPR81, a family of hydroxy-carboxylic acid receptors. Trends Pharmacol Sci. 2009 Nov;30(11):557-62. http://pmid.us/19837462. Spate-Douglas T, Keyser RE. Exercise intensity: its effect on the high-density lipoprotein profile. Arch Phys Med Rehabil. 1999 Jun;80(6):691-5. http://pmid.us/10378497. Bey L, Hamilton MT. Suppression of skeletal muscle lipoprotein lipase activity during physical inactivity: a molecular reason to maintain daily low-intensity activity. J Physiol. 2003 Sep 1;551(Pt 2):673-82. http://pmid.us/12815182. Yanagibori R et al. The effects of 20 days bed rest on serum lipids and lipoprotein concentrations in healthy young subjects. J Gravit Physiol. 1997 Jan;4(1):S82-90. http://pmid.us/11541183. Costa RR et al. Effects of resistance training on the lipid profile in obese women. J Sports Med Phys Fitness. 2011 Mar;51(1):169-77. http://pmid.us/21297577. Hamilton MT et al. Role of low energy expenditure and sitting in obesity, metabolic syndrome, type 2 diabetes, and cardiovascular disease. Diabetes. 2007 Nov;56(11):2655-67. http://pmid.us/17827399. Tall AR et al. Metabolic fate of chylomicron phospholipids and apoproteins in the rat. J Clin Invest. 1979 Oct;64(4):977-89. http://pmid.us/225354. Rice BH et al. Ruminant-produced trans-fatty acids raise plasma total and small HDL particle concentrations in male Hartley guinea pigs. J Nutr. 2010 Dec;140(12):2173-9. http://pmid.us/20980644. [9b] Mozaffarian D et al. Trans-palmitoleic acid, metabolic risk factors, and new-onset diabetes in U.S. adults: a cohort study. Ann Intern Med. 2010 Dec 21;153(12):790-9. http://pmid.us/21173413. Lakshman R et al. Is alcohol beneficial or harmful for cardioprotection? Genes Nutr. [Epub ahead of print] http://pmid.us/20012900. Thornton J et al. Moderate alcohol intake reduces bile cholesterol saturation and raises HDL cholesterol. Lancet. 1983 Oct 8;2(8354):819-22. http://pmid.us/6137650. McConnell MV et al. Effects of a single, daily alcoholic beverage on lipid and hemostatic markers of cardiovascular risk. Am J Cardiol. 1997 Nov 1;80(9):1226-8. http://pmid.us/9359559. Brien SE et al. Effect of alcohol consumption on biological markers associated with risk of coronary heart disease: systematic review and meta-analysis of interventional studies. BMJ. 2011 Feb 22;342:d636. http://pmid.us/21343206. Suh I et al. Alcohol use and mortality from coronary heart disease: the role of high-density lipoprotein cholesterol. The Multiple Risk Factor Intervention Trial Research Group. Ann Intern Med. 1992 Jun 1;116(11):881-7. http://pmid.us/1580443. Carlson LA, Hamsten A, Asplund A. Pronounced lowering of serum levels of lipoprotein Lp(a) in hyperlipidaemic subjects treated with nicotinic acid. J Intern Med 1989; 226: 271–6. Carlson LA. Nicotinic acid: the broad-spectrum lipid drug. A 50th anniversary review. J Intern Med. 2005 Aug;258(2):94-114. http://pmid.us/16018787. Dunbar RL, Gelfand JM. Seeing red: flushing out instigators of niacin-associated skin toxicity. J Clin Invest. 2010 Aug 2;120(8):2651-5. http://pmid.us/20664168. Bassan M. A case for immediate-release niacin. Heart Lung. 2011 Mar 15. [Epub ahead of print] http://pmid.us/21414665. Lukasova M et al. Nicotinic acid inhibits progression of atherosclerosis in mice through its receptor GPR109A expressed by immune cells. J Clin Invest. 2011 Mar 1;121(3):1163-73. http://pmid.us/21317532. Li Y et al. Effects of multivitamin and mineral supplementation on adiposity, energy expenditure and lipid profiles in obese Chinese women. Int J Obes (Lond). 2010 Jun;34(6):1070-7. http://pmid.us/20142823. Yanai H, Morimoto M. Effect of ascorbate on serum lipids and urate metabolism during exhaustive training. Clin Sci (Lond). 2004 Jan;106(1):107-9. http://pmid.us/12927020. Choi MJ. Effects of dietary taurine supplementation on plasma and liver lipids in OVX rats fed calcium-deficient diet. Nutr Res Pract. 2008 Spring;2(1):13-6. http://pmid.us/20126359. Elvevoll EO et al. Seafood diets: hypolipidemic and antiatherogenic effects of taurine and n-3 fatty acids. Atherosclerosis. 2008 Oct;200(2):396-402. http://pmid.us/18242615. Ruiz-Roso B et al. Insoluble carob fiber rich in polyphenols lowers total and LDL cholesterol in hypercholesterolemic sujects. Plant Foods Hum Nutr. 2010 Mar;65(1):50-6. http://pmid.us/20094802. Giacosa A, Rondanelli M. The right fiber for the right disease: an update on the psyllium seed husk and the metabolic syndrome. J Clin Gastroenterol. 2010 Sep;44 Suppl 1:S58-60. http://pmid.us/20616745. Ishikawa M et al. Taurine’s health influence on Japanese high school girls. J Biomed Sci. 2010 Aug 24;17 Suppl 1:S47. http://pmid.us/20804624. Hata Y, Nakajima K. Life-style and serum lipids and lipoproteins. J Atheroscler Thromb. 2000;7(4):177-97. http://pmid.us/11521681. That’s great! So happy about your son. Hopefully the improvement will continue. I believe that autism must be curable. Please keep me posted! And, like you, I’m not at all sure if the high LDL even suggests a real problem. The evidence against LDL is quite weak, and even the purely statistical association with heart disease and death is pretty minimal (even for those few people with the very worst numbers across the board). So other than refusing to consider taking a statin or any drug for it, I’m not sure what, if anything, to do about it. Which is why I’m not sure there’s any point in even letting my doc measure it. He will definitely not see it this way! Great Website! Trying to go through all the info. I was wondering what kind of diet someone like myself should eat. I have gone through ALL of them and have been leaning more towards a paleo type diet. I have chronic infections, like, lyme, fungi, mold toxicity, and also high CRP, SED rate, RF, and low HDL, a MTHFR Compound Heterozygous Mutation. It seems that you see high HDL in those with infections, and mine is actually lower than my doc would like to see it. What do you suggest for those with issues like mine. Actually, HDL is usually lowered in infections. But extreme HDL values in both directions can appear in disease. Dealing with chronic infections was in many ways the motive for our diet, optimizing diet helps defeat the infections. It sounds like you have a number of pathogens so I would suggest our regular diet recommendations (ie not a ketogenic variant which is sometimes beneficial). Nutritional supplements are important, especially minerals. If mold toxicity is a problem you may benefit from detox aids like bentonite clay, charcoal, or cholestyramine. But don’t take much – small amounts will help clear toxins, but too much can sabotage immunity against bacteria. Then, antimicrobial medicines. To choose the medicines you need a diagnosis of your pathogens. Thank you so much for your quick reply! So far, I only test to Lyme bacteria through western blot (IgeneX) and HHVsix titers were a little high but IgG. I have tried Cholestyramine without improvement. I am confused as to what the regular diet is. I am ordering the book, but, as I read, I am confused as to what the regular diet is… If you could point me in the right direction while I wait for your book, would be GREATLY appreciated!!! I have taken antibiotics, anti-malarials, herbs, supplements, etc… all without improvement. I am on all the supplements you list. Wish I knew what I was missing. Check out “The Diet” page, especially the food plate for a graphic summary. on the subject of Bentonite Clay; do you recommend this as just a Therapeutic supplement. Would there be any point/benefit or risk in taking this if healthy & feeling fine? (if yes, what would you recommend as the usage protocol). My HDL comes up consistently low despite hormonal, health and diet improvements. Last summer it was 48… this year it’s 38! Not sure whats going on here but your comment it being lowered during infections is telling. Perhaps I’m not consuming enough fat or fuel. Kruse talks about HDL being low in leaky gut… perhaps despite what seems like perfect disgestion (no bloating, reflux, perfect regularity, formed BMS) my gut is still “leaky”? These detox aids can bind minerals and bile/lipids as well as toxins, so too much can leave you malnourished. If they are lowering blood lipids, you’re taking too much. For this reason healthy people should not use them, I think. I’m not sure what’s causing it either but I wouldn’t blame a leaky gut if you don’t have an immune response (ie sleepiness, fatigue, brain fog) after meals. Came across your posts about increasing HDL and found very good, explanatory. Defecient in Vit B12 and Vit D.
I wanted to know more about the risk factor but doc never explained me well. I want to know how much is the risk for me? I also do not want to give up whole wheat bread and little rice. I do eat lot of vegetables but tend to use potatoes in preparing gravies / vegetables dishes. I am also eating chicken to get more B12. Is it ok to continue? Or shall I Reduce meat? I used to eat fish but now a days not eating. So want to know if it is ok to continue my diet which includes small quantities of whole wheat bread – 2 no.s and little rice (1 bowl)? Can I fix it just with moderate walk and having a glass of wine a day. Presently I do not drink wine. your Lipid readings are exactly the same as mine, with B12 vit d deficiency. I have started following a strict walking schedule for 45 mins eveyday and have seen good changes in my lipid readings. Also , strict diet schedule is equally important. mail m ewith ur id , and i can send you the best diest plan to reduce weight and lipid levels. It’s hard to quantify risk but it’s easy to fix. Normalizing vitamin D will help considerably. The best meats to eat are seafood, ruminants (beef, lamb), then poultry. It’s good to get some organ meats. For B12, eat some liver, at least 1/4 lb per week. Rice is good, but wheat you’d do well to minimize. Eat some butter and eggs too. A glass of wine is optional, it’s not necessary, but fine if you enjoy it. Walking is definitely something you should do. Thanks very much for the quick response / advice. Would you have similar misgivings as with other polyphenols? Curcumin seems to be beneficial in a host of studies. We’ve covered this topic fairly extensively — read the “Biomarkers” category for all our “High LDL on Paleo” posts, and also “Hypothyroidism” category has some useful background. The common causes of high LDL are (a) too few carbs in the diet, (b) hypothyroidism, (c) mineral deficiencies, esp iodine, selenium, zinc, copper, or selenium excess. What I would do is increase carbs if you’re low-carb, get tested for thyroid hormone levels, stop selenium supplementation but try to increase intake of shellfish and kidneys (which contain selenium as well as other useful minerals), and start supplementing iodine at a low dose if you’re not already doing it, plus maybe zinc supplementation – 15 mg/day is good. Thank you! My thyroid level is fine, I take thyroid. Does that change any of your advice? I just received many of the supplements you recommend from Amazon, haven’t started them yet. I will get my book out and study! Thanks again! So 3 months later: Much better, thank you! I also have been diligent about drinking water, something I wasn’t doing prior. Terrific, Diana! I’m glad you’re better. I bought the book. Loved it. Am trying to incorporate some safe starches back into my diet. I raised my hdl from mid 30’s to almost 70 by taking 1g of niacin (the real stuff not the non-flush) per day. I think I am going to incorporate the coconut oil and eliminate the niacin regimen. How long should I wait before retesting to see if the coconut oil is sufficient in keeping my hdl in the healthy range? Probably at least a month. What is the minimum daily amount of coconut oil that you recommend? About 2 tbsp coconut milk. Well, you asked for minimum. Our book suggestion was 2 tbsp oil per day which would equal about 6 tbsp milk. I wouldn’t consider that a minimum, there’s no demonstrated need for that much coconut oil, it’s just the amount that provides a shorter-chain fat fraction comparable to that in breast milk. How much do you recommend to impact cholesterol numbers in the same way as niacin? 2 Tbsp. of oil? Thank you for your replies, I appreciate your work very much and am looking forward to the new version of your book! Thanks for the quick reply Paul! I have stopped my 1g per day niacin regimen and started to take 2 tablespoons of coconut oil per day. I will retest in a couple months to make sure the coconut oil keeps my hdl in the healthy range. I was wondering if losing the vasodilation effect of niacin will have a negative health impact somehow? I don’t think losing the vasodilation of the niacin will be a problem. However, you may need more than 2 tbsp coconut oil or MCT oil to match the effect of 1 g niacin. The coconut oil would be most effective at raising HDL if taken during a fast, as in a 16 hour daily fast. I have been taking 1 tablespoon of coconut oil in the morning and 1 in the evening, but I can start taking 2 or more mid-morning, since I don’t eat breakfast, that would be close to a 16hr fast, since I usually don’t eat anything after 6pm. My hdl was 70 at last testing so getting down to 55 range would be ok I think. I donate whole blood regularly and at my recent donation they said my white blood count was excellent and wanted me to start donating the white blood cells from now on. My understanding is that you can donate every 2 weeks this way and it takes quite a bit longer to do it vs whole blood donation. The benefit of whole blood donation is the iron depletion but I doubt iron will get depleted when donating only the white blood cells?? Are you sure they weren’t asking for a “double red” donation? That will take twice as much iron, which is in the red blood cells, but you can only do it half as frequently. Glad to hear things are normal! Yes I am sure it was for platelet donation. That wouldn’t get rid of the iron though would it? No, seems like it wouldn’t. Ok. Since the WBC donation can take place every 2 weeks maybe I could donate WBC 3 times then do a whole blood to take care of the iron. I am wondering, would the good things in broth (glycine, etc.) remain intact if I use the broth to soak and cook white rice? Yes, they should. White rice doesn’t take long to cook so it shouldn’t break down the proteins. Hey Paul, do you have any idea about when consuming alcohol about how far apart should it be kept from salmon or other PUFAs? No, I don’t really know. I think if it’s moderate alcohol — say, 1 glass of wine — you probably don’t need to worry about separating them. If it’s a large amount then they’ll both concentrate in the liver and you may have problems. If you’re going to drink a lot, I would do it on days without salmon. I eliminated my niacin supplementation and tried the coconut oil and my HDL did stay in the 60’s. The addition of “safe starches” didn’t alter my other cholesterol numbers either, i.e. HDL-62 ,LDL-107,Trigs-34, and total cholesterol-176 were remarkably similar to previous tests. My LDL-P particle number was borderline high. This is the first time I had the NMR particle test done. I need to find out how to lower that LDL particle number. I did have a hs-CRP test done also and it was high at over 3. Not sure how to lower the hs-CRP results. Any ideas? or do you have an opinion on the value of hs-CRP tests? I have been fighting an ear infection lately and maybe that skewed the hs-CRP results. http://stm.sciencemag.org/content/4/148/148ra115.full?sid=508d5e51-001e-42d2-9a02-7af128fa5769 that states that niacin lowers LDL and TG while raising HDL via a pathway that does not target GPR109A, but rather a different, still unknown pathway. This study was published after you wrote this article. If this is true, would it alter your belief in the benefits of coconut oil? Thanks! Is there a reason why PHD is reluctant to supplement potassium outside of food sources? Given how important it is, and how easily diet can fall short of the required amounts, is there any harm in just using potassium chloride as a salt substitute with each meal? Particularly with rice, this seems like a natural combination since white rice is deficient in potassium compared to tubers. If we do supplement potassium, do you recommend potassium chloride or some other form? At what levels would we see potassium toxicity? Dear Paul. Can we ever have too much potassium? Yes, certainly, which is why the FDA limits potassium supplements to 99 mg per pill, but it’s hard to do it from food only. 99mg is very low and kept at that level per pill apparently because it is dangerous to consume at too high a concentration e.g., in a pill rather than in a food or solution. How can we compare this FDA limit to everyday eating/dieting plans? Is there any reliable data out there indicating at what levels we would see potassium toxicity when it comes to eating and not supplementing? I guess a more useful question might be to ask what the ratio of sodium to potassium should be according to PHD? Yes, supplements are an artificial situation, yet it points to the danger of too high a potassium concentration. It is hard to name an intake at which problems would occur because it is dependent on salt and water intake. If these are in balance then the kidneys can excrete the excess effectively and it is hard to produce toxicity as long as the potassium comes in slowly enough. In kidney disease, or with an extreme potassium/sodium imbalance, or in dehydration, you would run into problems more easily. Ratio of sodium to potassium is discussed in the book. So if maximum sodium is 2325mg then maximum potassium would be 5346mg to maintain that healthful balance without consuming to much sodium. Would you say working it out this way is ok? Or too simplistic? I think that’s a fair analysis but it probably overly constrains the safe range. As long as everything is in balance then the body should tolerate more fairly comfortably. Yamawaki et al. : Macronutrient, mineral and trace element composition of breast milk from Japanese women. J Trace Elem Med Biol. 2005; 19(2-3): 171-81. Epub 2005 Oct 24. You should consider updating this article to include that Seth Roberts died of occlusive coronary artery disease and cardiomegaly in 2014. I am not necessarily blaming his somewhat excessive butter consumption, but it’s best to be fully informed. Hi, so I am looking at this half bar of butter idea. Now either this is completely arbitrary, or we are missing something in this whole theory. Either 60g of butter per day is bad, or something else we dont know about caused that or starting to eat butter 60g a day at age 56 is too late to fix the damage from previous years (and diets). Whatever it is, CT is not catching it. Or the CT score is missing some very much crucial variables. We must feed ourselves according to maximum economy principle – but not the disorder – in our every cells. The maximum economy principle can be found in the composition of human milk, which is an evolutionary perfect food for babies (from every viewpoint). Naturally, the composition of the human milk is the perfect guide for adult nutrition (sodium/potassium ratio, ratio between sum of alkaline metals and sum of polyvalent metals, ratio between metals and energy content, etc.). The unnecessary sodium salts increase the incidence of every illnesses without any exception! The evidences: In the scientific literature & media the salt has political- & a lot of pseudoscience but real science of salt we can find only in traces because it’s really CENSORED globally. It’s time to understand, teach & use some very important but forgotten & ignored knowledge; fundamental natural laws/facts & to see the sad reality. The spontaneous diffusion of Na ions into the cells & the diffusion of K ions out of the cells continuously enhance the entropy (disorder). The task of the Na/K pumps to keep constant the intracellular concentration of Na & K ions. These cellular pumps continuously use energy (ATP). Excess Na intake = excess diffusion = excess increase of entropy = excess work for pumps = excess energy expenditure against excess entropy > excess food consumption. But all the rest of our vital processes (functional processes of the cells) receive less energy because our capacity (to make energy from foods) is limited (Kleiber’s law). Everything work worse in our body & this increases the incidence of all illnesses without any exception, our aging & devolution accelerate etc., this is why Na-salts are perfect foods of entropy. 10th ed. of RDA was the best recommendation ever, 500 mg/day Na! Sugars & fats are foods & are sources of energy. But entropy & Na intakes = five decades global censorship, corruption, pseudoscience & lack of real science. Excess Na intake significantly enhances the excess diffusion (excess entropy) because the surface (billions) of cells is extreme large, this is the main risk factor of diabetes 1-2, overweight, NCDs etc. & our devolution is a considerable fact too. The law of entropy is the fiercest enemy of life & is our fiercest enemy too. NaCl isn’t food for humans but is perfect food of entropy. Every mmol excess Na & the wrong Na/K ratio & other wrong ratios increase more the entropy in our every cell, but the specialists talk about these rarely or NEVER. Excess Na intake doesn’t increase the oxidative pathway, but a critical surplus switches the anaerobic glycolysis on, in our every cell & we produce cytotoxic lactic acid. This is the Sodium-Induced Cellular Anaerobic Glycolysis (Osaka et al. 2001., but the article was censored). All of our vital processes & organs work worse (heart, brain, regulating systems, immune system etc.) & our cells are dying. We haven’t enough energy & enough time for the regeneration because we enhance the entropy in our every cell, day by day, again & again. The average lifetime of our cells shortens. Faster the telomeres run out. Our aging accelerates. We get sick often & we will die soon. Logical consequence: the unnecessary salt increases the incidence of all illnesses without any exception! This is the no named Sodium-Induced Disorder Syndrome. The entropy law finds our weak point or points & ravages mainly there, but increases the disorder in every cell in our body. We are no uniform, so other risk factors & circumstances affect the individual consequences. The growing entropy is our number one public enemy on every level; physical & mental health & social level globally. The evolution of life on Earth, our history & our entire individual life is a continuous war against entropy. But we, humans started our devolution = the entropy is growing in human genome. Even we nourish the entropy in our every cell (fundamentals of our existence) but the health scientists don’t talk & write about this. This is really a fatal error. Non-communicable knowledge is too much in salt science, it’s time to change that, because we will die out within 250 years! De Luise et al. : Reduced activity of the red-cell sodium-potassium pump in human obesity. Henningsen N.C.: The sodium pump and energy regulation: some new aspects for essential hypertension, diabetes II and severe overweight. Klinische Wochenschrift 63 Suppl 3:4-8. 1985. Sandor Z.: Equivalency law in the metal requirement of the living organisms. Acta Alimentaria 27 (4): 389-395. 1998. Abstract: From information referring to metal requirements of the human organism as well as metal contents of human and cow`s milk and cereal grains it was concluded that an Equivalency Law exists in the metal balance of the living organisms. According to this law the alkali metal requirement (mainly potassium and sodium) is chemically equivalent with that of polyvalent metals (namely calcium, magnesium, zinc, iron etc.). Theoretical considerations are given for proving the existence of the Equivalency Law. Very important note: This equivalency law is a perfect example of the maximum economy principle in biology (but it’s ignored). Osaka et al. : Thermogenesis induced by osmotic stimulation of the intestines in the rat. J Physiol. 2001 April 1; 532(Pt 1): 261–269. Macronutrient, mineral and trace element composition of breast milk from Japanese women. From this: “Meanwhile, the research literature on obesity has also ballooned. In 1960, fewer than 1,100 articles were published on obesity or diabetes in the indexed medical literature. Last year it was more than 44,000. In total, over 600,000 articles have been published purporting to convey some meaningful information on these conditions. But this is ignorant stupidity. Don’t need theory. Stone-hard evidence exist, but it’s ignored and censored globally. The resurrection of the real science of salt will be a fantastic historical moment for the prevention of every diseases. But without resurrection – the carnival is over, and we will die out. In these two articles (Osaka et al. and Mathur) absolutely nothing about entropy, Na-K pump, anaerobic glycolysis and lactic acid. Bad education, oblivion or something else? 9 years and 45 years after Klahr & Bricker, and the mechanism of thermogenesis was not clear really, for the authors and editors? Or …? The floor gas (anaerobic) sodium-potassium pump devours the energy (and we produce lactic acid), but it’s not enough, and our cells are dying. We haven’t enough energy, and we haven’t enough time for the regeneration, because we enhances the entropy (by high salt intakes) in our every cells, day by day, again and again, the entropy devours our energy. All the rest of our vital processes (functional processes of the cells) receive less energy, and all of our organs and vital processes work worse (including our heart, brain, regulating systems, immune system, etc). This is responsible for the generation of atherosclerotic plaque. And this is responsible for the low physical activity. And this generates strong hunger (and thirst). We overeat and get fat. And indisputable consequence, that the unnecessarily swallowed excess sodium increases the incidence of all illnesses, without any exception, including even the genetic disorders, cancer, NCD’s and infectious diseases. Some people will be obese others not, some become diabetes others not, some have high BP others not (or later), etc. We are not totally alike, but the entropy law finds our weak point, and ravages mainly there, but increases the disorder in every cells in our body (and other risk factors affect the individual consequences). I definitely agree with an above comment that states the section about Seth Roberts should be updated. Not attributing cause necessarily but there should definitely be full disclosure of information regarding his death. Perhaps it was the vitamin K2 in the butter that improved his CAC score?? ?